Viking's Tool and Die team consists of roughly 20 employees with years of experience in this high precision atmosphere. Viking produces tooling for both it's own production facility and it's outside customers. Our tool makers are accustomed to working with tolerances as tight as +/-.0001". Viking has a wide array of capabilities including CNC milling, RAM EDM, wire EDM, carbide grinding, hole popping, CNC lathe w/ live tooling, Blanchard grinding, etc. 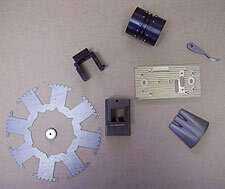 We also offer complete tool assembly and tryout. Industries we service include aerospace, automotive, medical, and connector industries among others. Our capacity and dedication to customer satisfaction has enabled us to provide our customers with quick turnarounds and a 95% on time delivery rate.